A few days ago, Tesla unveiled its latest vehicle the Tesla Model Y, an electric crossover that is more affordable than the company’s existing SUV the Tesla Model X. As soon as the company unveiled its new vehicle, a narrative in the media started to develop that basically said the Tesla Model Y is boring. The reason that this narrative seems to have developed because the Tesla Model Y is very similar to Tesla’s existing vehicle that is the Tesla Model 3. Although it is a crossover and it does have a few features that are different from the Tesla Model 3 but these are features that can be found in Tesla’s other vehicles like the Model S and the Model X. Let’s explore why this narrative of the Tesla Model Y being so similar to the Tesla Model 3 and not really doing anything really new is actually a good thing. When the Tesla Model X was unveiled many years ago, many industry analysts and auto journalists looked at this car and looked at what Tesla unveiled and there was no way that any other manufacturer going to be able to manufacture a car like Tesla Model X. There were so many cutting-edge complex features in this car and especially with the Falcon wing doors which are the Tesla Model X’s signature feature. Many analysts were like “there’s no way Tesla bringing that to market”. It was almost like they were egging Tesla and Elon Musk and the Elon Musk were like “we’re ready for the challenge”. Looking back on this program, though those industry analysts and car journalists were somewhat correct in the assessment that this car was going to be almost nearly impossible to manufacture. The Model X program had cost overruns, it was just sheer hell for the company and this is where manufacturing hell started for Tesla. Looking back on it, Elon has blamed hubris he said we’ve put too many features and over-engineered the car and he’s jokingly said that they probably should have never made the Model X and no one should ever make a car like the Model X. That is how much held this company went through when manufacturing the Model X. Looking back at that program, it brings us to the next vehicle- The Tesla Model 3, it was supposed to be different, Tesla did not want to make the same mistake which they had done with the Model X. They couldn’t afford to give in the margins they knew they were going to have on the Tesla Model 3 and it’s $35,000 price point. Tesla had stated that the Model 3 was going to be designed to be easy to manufacture and it would have very few options when a customer would order a car. There was one problem and that was the manufacturing assembly lines for Model 3. Somewhere along the line after the Model 3 was announced, Elon Musk and Tesla became fixated on this idea of the machine that builds the machine. This was something Elon talked in many calls with shareholders, at each of the quarterly earnings calls, he was fixated on this idea of the Fremont factory becoming an alien dreadnought full of automation. It would be unrecognizable from what it would look like today and they were going to start this process of the machine that builds the machine with the model 3 assembly lines. There was only one problem with that, unlike with the Model X, Tesla did not over-engineer the car but they over-engineered the process of building the car with the Model 3 program thus beginning their second manufacturing hell. Basically, everything’s been manufacturing how up until this point but this was just on such a huge scale because the Tesla Model 3 is a mass-market car. They are anticipating making hundreds of thousands of these cars a year. The fact that Tesla over-engineered the Model 3s assembly lines meant that this car was delayed and put an enormous amount of financial strain on the company. However, they did eventually get out of manufacturing hell and they were able to start making the model 3 at scale just a little bit later than they thought. Tesla had spent way more money than they should have on the Model 3 program and this time they did not want to do same mistake. So, with all of that Tesla brings us to the Tesla Model Y. The Tesla Model Y looks very similar to the Tesla Model 3. 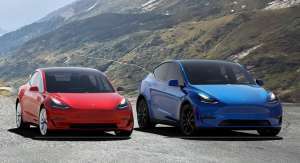 Tesla’s said that the Model Y is going to share around 75% of its parts with the Tesla’s Model 3 which is why they look so similar. It looks similar to Model 3 but that doesn’t mean that the Tesla Model Y is boring. None of the Tesla vehicles is boring but it is very similar to the Model 3 and it’s not really doing anything new in terms of its features. It does have a few features like the gorgeous panoramic roof, power liftgate as well and more storage space- none of these things are in the model 3 but they can be found in other Tesla vehicles like the Model S in the Model X. They said instead of over-engineering the car or over-engineering the manufacturing process, let’s just take what we’re doing with the Model 3 program, use as many parts as we possibly can to build a crossover SUV. Tesla not only know how to make this car but also have the relationships with the third-party manufacturers that make the parts but they also should know how to build this car because they can model it in the way that they have with the model 3 assembly lines. Tesla needs to announce a car, manufacture it with relatively no issues and then release the car on time. This is what the major car companies like GM, BMW, Mercedes does. Unfortunately, Tesla has not been able to do this up until this point, if they do this with the Model Y, that is going to send a signal to everyone across the globe that Tesla is a mature car company.